The political power of the Pope cannot be ignored. It is a worldwide force to be reckoned with. The new pope, Francis, is making an impact within the Vatican and the Roman Catholic Church. He is also providing political cover for politicians campaigning to lift the state of the poor, combat wealth inequality, and argue for more efforts to reverse climate change. 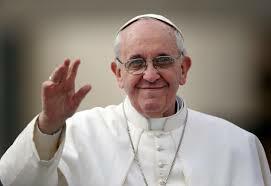 Whether you are Roman Catholic or not, the interest in what the pope thinks and says has been a news item since he was first revealed to the world from the balcony of St. Peter’s Basilica on March 13, 2013. Pope Francis chose his name to honor St. Francis of Assisi who is revered for his work with the poor. Right from the Pope’s first appearance in his office, he has continued to break from tradition and do what he knows to be right in his heart. Rather than bless the crowd as his first duty as the new pope, he instead asked the crowd to pray for him. Rather than live in the Apostolic Palace, the pope chose to live in a simple two bedroom suite in the Vatican guest house. He even decided not to use a chauffeured limousine. His break with tradition continues to grow as he embraces the poor, the sick and the incarcerated and washes their feet in the tradition of other Roman Catholic clerics. As Syrian refugees flee and seek refuge in Western Europe, the Pope has called on “every parish, religious community, monastery and sanctuary to take in one refugee family” which can help provide shelter for tens of thousands of people. The Pope wants the Catholic church to show compassion upon Syrian refugees who may be Muslim. The world is too small for ignorance or hate. The pope added that some refugees would be given a place to stay in two parishes within the jurisdiction of Vatican City. The biblical verse: “I was a stranger and you welcomed me,” (Matthew 25:35) holds great power in dealing with the refugee crisis. Even Jesus was a refugee as his parents fled home in the fear of death and escaped to Egypt. Jesus was an itinerant, poor preacher and teacher by choice. The teachings and politics of Jesus shaped Christianity and how we are to live with each other in this broken world by ensuring that all people receive a living wage. In this same legacy, Pope Frances carries on his papacy by prioritizing the concerns and plight of the poor. The Pope’s encyclical poignantly addressed climate change and the affect it has on the most vulnerable in our society. Climate change which is least caused by the poor, affects the poor the most. As the Pope visits the United States this September 2015, a highlight will be his speech to Congress. The concerns raised by the Pope should not be taken lightly as laws are being formed and made. The Pope’s politics of speaking for the poor, marginalized and disenfranchised should also be the concern of American lawmakers. If one man’s voice can change the political scene why not hundreds of lawmakers who have the power to write laws so that more equality can be achieved and social justice can be established. We need a new type of politics. The old political thinking of the “trickle down” effect has not worked. The new moral leader of the world is setting the scene for a new political scene. As we enter the 2015 U.S. presidential election season, the candidates cannot ignore Pope’s teachings, writings and speeches. If the presidential candidates want to be taken seriously, they may just have to dance to the new tune of the Pope’s politics that includes new economics, environmental justice, new immigration policies and a renewed commitment to seeking the common good. **Note: The article originally appears at The Huffington Post. Permission from the Author.